sailboat. : Autumn Make Up! Even though I'm not really one for seasonal make up, reading a few posts over the past few weeks has inspired me to have a little rummage around in my collection to see if there were any products I hadn't used in a little while or any that were perhaps a little more autumnal in colour and had found themselves tucked away at the back of a drawer. I found a few, so I thought I would share them and writing it down may actually make me switch up my make up a bit and use some of the things I haven't touched in a while! Admittedly a lot of my base make up products will stay the same; the Collection Lasting Perfection concealer is too good at covering pretty much anything to be replaced, Benefit Boi-ing concealer can't really be beaten on those stubborn blemishes & Maybelline The Eraser Eye is perfect for those pesky dark circles that seem to get more prominent as I get slowly more transparent as the sun disappears. 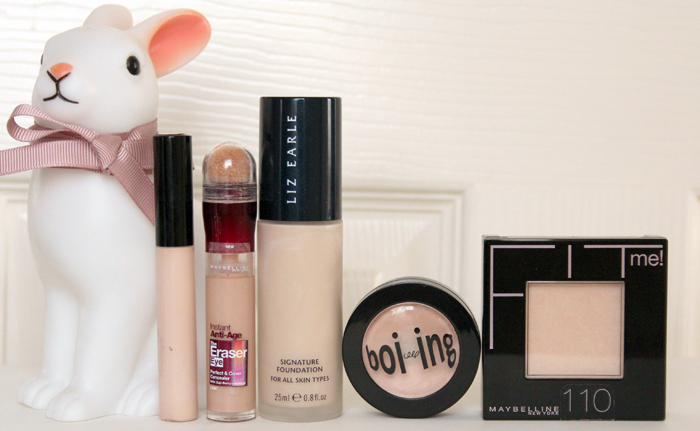 I've been a real lover of glowy skin for the last year or so, I'm going to embrace a more matte complexion. I've been using, and loving, the Maybelline Fit Me Powder in the lightest shade for a little while because it never looks powdery or cakey and the colour is pretty much perfect for me! The Liz Earle Signature Foundation* is one I've had for a little while and I really enjoyed using it previously so I'm not quite sure why I stopped. I've been using it again for around a week now and I absolutely love it, the lightest shade is the perfect match and it gives a really natural finish. I'm going to try and be a little bolder with my lip colours, if there's ever a time to rock a deep pink or plum lip it has to be Autumn. 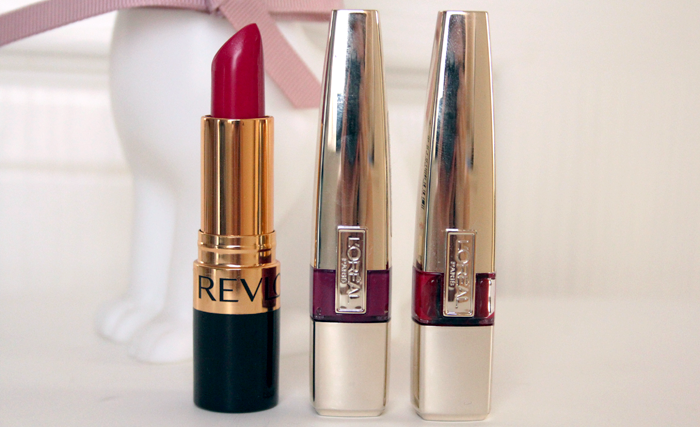 My beloved Revlon Cherries in the Snow lipstick, a stunning red toned pink, is going to be one I reach for a lot this season. It's one of my all time favourite lip colours and I don't reach for it often enough. Then I have two of the L'Oreal GlamShine Stain Splashes in Milady and Juliette. Juliette is a gorgeous red and Milady is quite a dark purple shade that I've not really been brave enough to wear yet. I'm determined to give it a try this season and try and make it work for me! I'm still a bit in love with easy to wear tinted lip balms and I don't think I'll be giving them up any time soon! 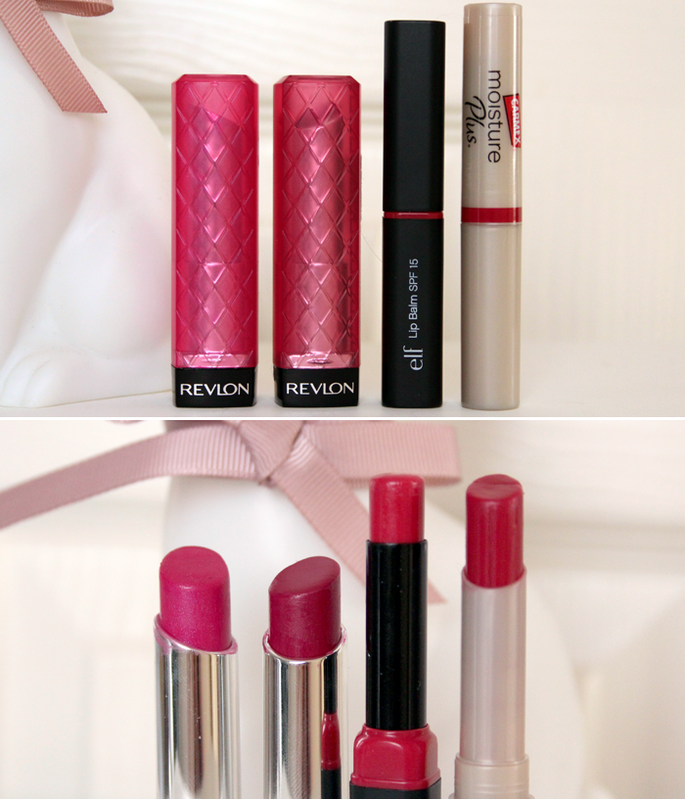 The Revlon Lip Butters are a real favourite of mine, especially the shades Lollipop and Raspberry Pie, I really like the formula and they provide just enough hydration for my lips in the colder weather. I also have one of the ELF Studio Lip Balms in Rose* and one of the Carmex Moisture Plus Tints in Berry* - both are really beautiful tinted balms and super affordable too, which is always a good thing in my eyes! These are all pretty sheer, but you can definitely build up the colour and they just so easy to apply - perfect for on the go application! Cream blushes and stains are going to be a staple in my make up routine because they apply so nicely, look super natural and they give my cheeks a little bit of a glow, which I really like when my foundation is a little more on the matte side. The first blush I have here is the Sarah McNamara Miracle Skin Transformer in Fresh Rose* which is a beautiful, natural colour that really helps to sculpt my face & this is one of my favourite make up products right now, I think it's amazing. I've been testing out this ELF HD Blush* and it is SO insanely pigmented, it's almost a little too much. This is one I absolutely have to apply with my fingers or it's far too easy to apply too much, which I have done and I ended up looking like a clown! This is one I'm going to have to work with a little more, but I think it may be one that's perfect for darker skintones and not so great for fairer skin. Another all time favourite make up product is the Estee Lauder Cello Shot blush in X-Pose Rose* and although it looks super bright, it's actually really sheer & wearable! It builds up quite nicely too so it's also quite versatile and I really like this deep fuchsia colour. When I feel like more of a liquid stain, there's my trusty Benefit Benetint which is a beautiful rose shade that looks pretty on the lips too! Two Illamasqua blush favourites are Laid and Tweak and as much as I love them all year round, I think these colours are particularly appropriate for Autumn. They're both super pigmented, so I have to use a really light hand, but I think a pop of colour on the cheeks looks pretty with matte skin, lots of mascara and a light tinted balm. Finally, at the back of my drawers I rediscovered this super beautiful Modalista blush that I got in a swap and when I swirl all the colours together it gives a pretty natural rosey flush. I used to wear this all the time and I remember loving it so I'm excited to have rediscovered it again. I love the packaging too, it's got a really good sized mirror inside, which I always appreciate because I always seem to lose mine! Do you like to switch up your make up for Autumn? Have you got a particular product you're excited to wear a lot this season? I'm one of those "grab whats around" type of people normally with my makeup, but I've been trying to make a conscious effort to use different things and experiment more. So I love these types of posts on what to mix together. You just reminded me to dig out my benefit boi-ing concealer, forgot how much I loved it! 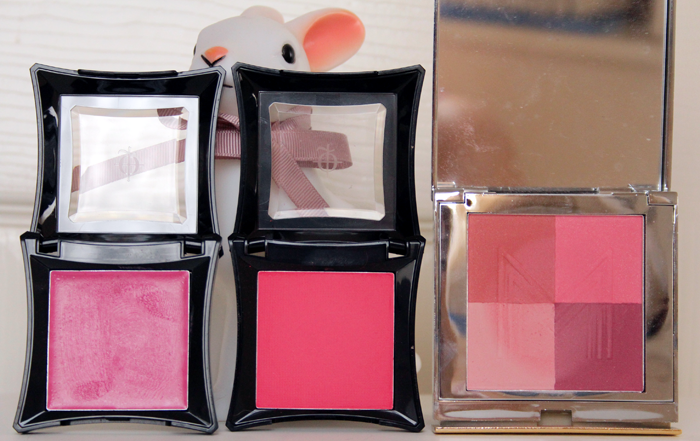 The Modalista blusher looks absolutely lovely, as does the Revlon lipstick. I have to agree, the ELF HD Blush does look a little terrifying though haha! I've also re-found some products from my makeup draws when sorting out for autumn.Loving all the berry colour blushes and lip colours! I'm most excited to start wearing MAC plum dressing eyeshadow blended in with bisque and antiqued.Its my go-to eye makeup look for fall! Aww! Such cute makeup. 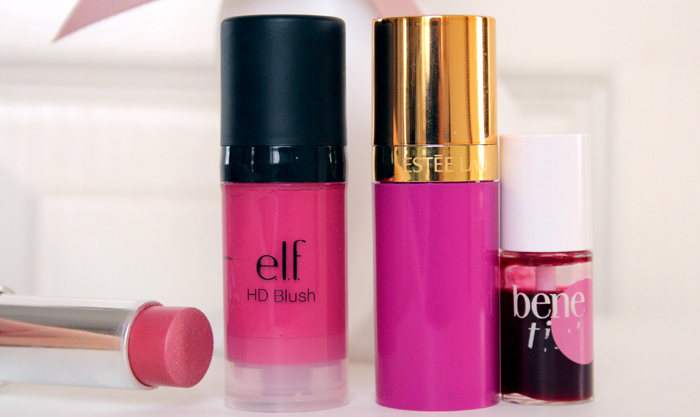 I really love deep shades of lipstick for fall too- it's about time I break mine out! I really love lip butters, they are so wearable & moisturizing! I'm the kind of girl who wears darker lips no matter what the time of year it is, but I'll be doing it a lot more in autumn. I can't wait! i love your concealer picks!! collection2000 is just irreplaceable and the maybelline age rewind is just too good for under the eyes. I've seen a bunch of Autumnal makeup ideas on the internet recently and I'm excited to try some stuff out- these colours are gorgeous and really suit it all well!